Welcome to Makarios Ranch, where we ride all 4 seasons....as long as the wind chill is not too low, or the snow too deep, or the heat factor too high! ''Makarios'' is the Greek word for Blessed, and blessed we are!!! Most days in NM are terrific for horseback riding!! 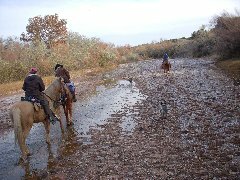 When the weather cools, and the bugs leave the bosque, we enjoy many Glorious River Rides. Even in winter, most days are bright and sunny at Makarios Ranch! We have some good gallops when we are a group of folks who are accomplished riders and feel totally confident. YIPEEEEE!! Makarios Ranch is located near the historic villages of Cerrillos and Madrid NM. These are on the Turquoise Trail National Scenic Byway, which links Albuquerque to Santa Fe via Hwy. 14. Santa Fe is about 20 miles to the north of Cerrillos, Albuquerque about 50. We mostly ride in the Galisteo Basin and the Ortiz Mountains, but when the weather is cooler, we also ride in the Cerrillos Hills Historic Park; this is a 4-5 hour ride. We bring water and snacks, and usually stop for lunch somewhere along the way!!! Sadly, this ride is not for 'strangers' as it once was, because of licensing stuff with the state, who now owns the land. Individual horse owners can go ANY AND ALL TIMES!!! 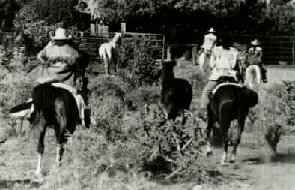 Riding in the Cerrillos Hills Historic Park is one of our MOST FAVORITE rides!!! 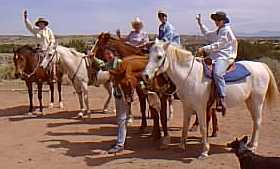 If you own your own horse and want to come with us, we can take you on a super fun ride; we can meet you at our Ranch and you can go with us down the Galisteo, or we can meet you in the village of Cerrillos. You can return to Cerrillos to visit Todd & Patty Brown, and explore their Casa Grande Trading Post, Petting Zoo & Mining Museum; they also sell gorgeous Cerrillos Turquoise, mined since before the 1600s, but made world-famous by the Tiffany & Co. in the late 1800s. BREAKFAST ANYONE? Depending on the time of year, you might have time to eat some great green chile burritos, Madrid scrambles, or a variety of other goodies, served up at San Marcos Cafe on Hwy. 14 between Santa Fe & Cerrillos. For the BEST food in Madrid, be sure to go to The HOLLAR Restaurant, open 11am-9pm daily, serving super delicious food created by Chef Joshua Novak, a lifelong lover of making great food, and a graduate of Le Cordon Bleu School of Cooking. He uses only the finest ingredients, organic as possible, and local as possible, including local grass fed beef and bison. If you have worked up an appetite after your super fun horseback ride, Madrid is the place for you! Try a great meal at the Mineshaft Tavern or Mama Lisa's No Pity Cafe. And a new restaurant with great outdoor seating has just opened -- The Hollar, a personal favorite! Want a delicious coffee in a fun atmosphere? Try Java Junction!. Madrid has many fine galleries and art studios, and you'll be able to see some of the settings for that super fun movie, Wild Hogs, starring John Travolta & William H. Macy, one of my all time favorite actors! Toomba and I had the blessing of meeting Bill, what a super nice man!! About 7 miles north on the Turquoise Trail is the Thunderbird Cafe, serving a huge variety of their yummy burgers. And just north of that, the San Marcos Cafe, where one of the views out the window is Susan's peacocks, fan tails in full glory; she has both white and traditional blue!! If you are heading back to Albuquerque, or just want to drive a few miles south, a must-stop is the Golden Mercantile in Golden, NM, Since 1918, it has offered the very best in Native New Mexican jewelry at the best prices around; discover this hidden gem for yourself!!! For a real post-riding treat, be sure to take the Scenic drive north on Hwy. 285 to Ojo Caliente Hot Springs. You can stay there too, but if you just want a couple of hours in the spring or the hot mud bath, the drive is well worth it! Your Makarios Ranch Riding Experience will be great all around!!! & WANT TO OFTEN REPEAT!! 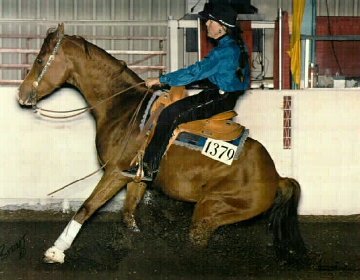 Wintersett (aka Whinny) is the son of the great purebred Arabian Stallion Gdansk. At the present time, Whinny is fighting equine melanomas, which started at age about 10; he is now 23 and still doing well; we are trying a new treatment and pray this is the one that will give him another 15 years of great life!! hope all our long-time friends will now find us here!!! If you are looking for riding lessons or horse camps, please visit my friends Lynn Clifford in Cerrillos NM, and Liz Sanchez in Albuquerque!